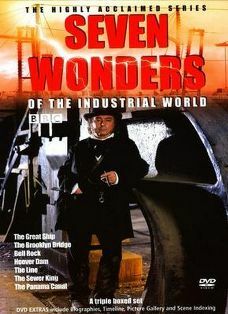 Some time ago there was a BBC series called Seven Wonders of the Industrial World on the box, and The Spouse and I watched it, enthralled. It dramatised the 19th century building of major projects such as the Panama Canal and the Bell Rock Lighthouse, and what I remember best from the series was the sense of determined optimism of the designers and engineers, and the appalling cost in human deaths that accompanied almost all the construction works. The Brooklyn Bridge was actually finished by Emily Roebling – who taught herself engineering so that she could take over the project after her husband died from decompression sickness, caused by working in the caissons (watertight chambers that are part of the underwater foundations of the bridge). But it was rare for management to die; it was workers, mostly unskilled and unacknowledged, who died in terrible numbers to achieve these engineering feats. Lest anyone think that the days of cavalier attitudes to workplace safety are long gone, there is our own Westgate Bridge to remind us. I remember its collapse in 1970 vividly because I wasn’t far away, having a driving lesson at Fishermen’s Bend, and the disbelief and confusion was shocking. 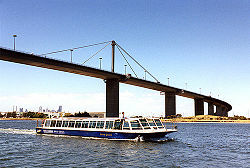 35 men died that day when a span fell into the Yarra River below, the disaster caused by poor design and an ‘unusual’ method of construction, as the Royal Commission subsequently found. My seven-year-old son and I were among the first 1000 people across the bridge when it finally opened in 1978; I felt we owed it to the men who died and those who then finished the construction to show faith in it – but my heart was thumping as I drove across that bridge with my precious child beside me and to this day I always spare a thought for the 35 each time I use it. 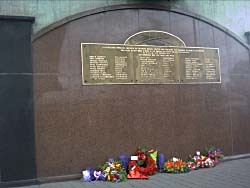 A memorial plaque was built and paid for by the workers in 1978, but it was not until 2004 that a memorial park was established ‘to increase awareness in the community of workplace accidents’. The Comfort of Figs is a fine story which links the dangers inherent in the building of Brisbane’s Story Bridge with present day violence and trauma. The relationship between Robbie, a young landscape gardener and his girlfriend Freya is put to the test in the aftermath of the kind of assault that occurs all too often in a modern city; he also has a fractured relationship with his father – who worked on the construction of the Story Bridge, the bridge that enabled Brisbane to grow from a country town into that city. From this shocking beginning, the story shifts to a dreamy evocation of Brisbane, home of the landscape gardener and his obsession with Moreton Bay fig trees. Although it’s set in the present, these early chapters have a sense of timelessness as Robbie plants his seedlings throughout the city, one for each day so that by year’s end there are 365 more trees than there were. This passion to green the city with these beautiful trees is a reaction to his father’s obsession with the manmade bridge: Robbie is devastated by a childhood birthday Meccano set, he doesn’t want to build things, he wants to grow them. Like the Story Bridge itself, The Comfort of Figs is meticulously constructed and shaped in three sections, beginning with the story of Robbie and Freya; then in the middle the story of the men who built the bridge during the latter years of the Great Depression; and finally the irony of Robbie’s quest to learn more about his father from a stranger, when his mother has the answers all along. The central section is different in tempo to the bookends. As it builds to its crescendo the reader shares the men’s outrage that engineers know before work starts that there will be deaths amongst the workers. At the Empire Hotel (Cleary’s research seems meticulous) young Carleton, trying to be accepted as ‘one of the men’ despite his age and his exclusion from the actual bridge works, proclaims his theory about the bridge engineers calculating a predictable number of deaths during construction. An experienced bridge builder called Irish seems to confirm it: ‘On your New York skyscrapers, boys, the formula was a life for every floor’ he says,(p198) sparking a venture that leads to tragedy, guilt and enduring trauma. There are other reviews at the SMH, The Australian, MC Reviews, Literary Minded and The Age. The Comfort of Figs won the Queensland Premier’s Encouragement and Development Prize in 2005 and was the ’emerging writer-in-residence’ at the Queensland Writer’s Centre in 2006. According to the writer bio in the front of the book Cleary lives in Melbourne now, and I hope we’re nurturing his talent too: I’m looking forward to his next novel. Michael Ondaatje’s beautiful book ‘In the Skin of a Lion’ is another such testament to the human cost of industrial urban design, in the Canadian context. I adored teaching this book to seniors for their HSC. Must chase this book up as well. Thank you Lisa. I saw that series too – and loved it. Absolutely fascinating. Long before it, though, I also saw a wonderful documentary about Brooklyn Bridge – that is one amazing story, and a gorgeous bridge too. 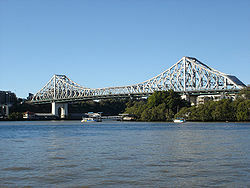 However, the first “real” bridge in my memory is the Story Bridge because for 6 years my grandparents lived on one side of it and we on another – it would be fun to read a novel featuring it. Another book I need to read… I lived in Brisbane in 1994 & 1995 (I did my Masters at UQ), so know Brisbane fairly well. I’m sure it’s changed a lot in the past 15 years though. This is why the Miles Franklin remains important, Kim. We love to read about ourselves and our history and the place we belong.